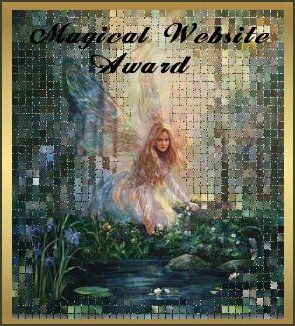 I would like to announce that you have been chosen to win the Magical Website Award. There were many applicants this month and they were all very good,creative and beautiful in their own respects. I give credit to both novice and pro webmaster. It is the passion and magick I am looking for. Of all the applicants, your website along with others I have chosen are listed on the awards page. You may pick up your choice of graphic award from the link below. Please do not remote link because geocities does not allow this. You must save the graphic to your harddrive and upload to your server. You may also use a text link too. I change the award graphics sometimes if I have time to play with my psp :) so you can change your awards look whenever you wish. I am always amazed by the individuality of all the millions of websites out there. The creativity and uniqueness of each one out of millions is magical in itself. Thank you for applying and keep up the great work.